Ashalatha sister shares her wonderful leela of her Punyathithi celebration in home and narrates how the family was blessed by Baba at each and every step .Attached below is her mail .Jai Sai Ram. I would like to share the blessings that I reaped during these nine days of Navaratri by doing Sai Satcharitra Parayan,Gurucharitra Parayan and on Dussehra the blissful pooja at our home for Sai Baba's Punyathithi. I started Sai Satcharitra and Gurucharitra parayan with a group on 19th Saturday .That evening I went to Hindu temple and to my surprise I found a beautiful portrait of Sai, its my favorite photo of Sai. I was so happy to see Sai as that was not a Sai mandir and I picked up the frame to take it .Just then another devotee who is known to me said she just saw this photo of Sai, and was in a dilemma to pick it or not? She also added that when she see face of Sai in this photo she remembers her mom.Immediately I said fine then you please have Sai, though it was difficult for me to share I felt let her have the happiness of taking her Saima home. From that temple we headed towards Sai mandir, the temple was wonderfully decorated and they had also kept ‘kolu’ with all the deities and the temple had its own festive mood. After the dhoop arati we were having Prasad and the priest was getting prepared to start Navrathri pooja. Volunteer of the temple asked me whether I would like to join? my husband too told me to go ahead. It was just a divine feeling to be there and to participate for Lalitha Sahasaranamam chanting in front of my Saima. It was a real bliss we did kumkum archana and then Mahishasuramardini, arati .I was so happy for this blessing of my Sai (actually I had planned to chant Lalitha Sahasaranamam at home after returning from the mandir but I noticed Sai had planned me to do it there infront of HIM in mandir). My mind was just filled with Punyathithi preparations at my home, I was trying to list out the devotees to be invited, pooja to be held, its timings, Prasad to be prepared and the most important thing was to my Sai’s approval before I go ahead with my plans. That day being 20th Sunday we went to drop our kid in the temple class I entered into the same Hindu temple, Lo, can’t just express in my words Yes, my Sai in A4 size poster with his hands blessing and the words”Why Fear, when I am Here” was written. I just grabbed my Sai and did not want to share with anyone, acted very selfish hugged Sai and kept immediately in my bag. 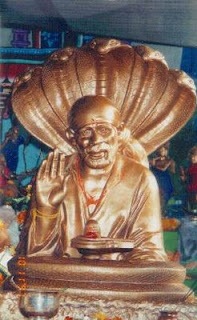 When I looked into the picture I found small words printed at the bottom of Sai’s picture”Vijayadasami 2004”. 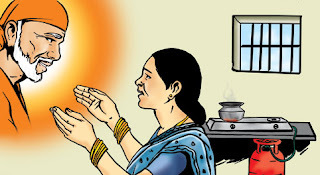 I felt that the words engraved on Sai’s picture are the assurances to me for my pooja. On Monday 21stI took permission from Sai and Sai gave his reply in affirmative to go ahead with the pooja. Sai has been giving me a strong instinct to do Rudra Abhishekam (since I dreamt Sai performing shiv thandav) on Punyathithi, and Baba made all the necessary arrangements for the puja. I have not attended any pooja of this sort until then nor I had a shivlingam at home!!!!!. Just exactly a week before (previous Monday) I came across a girl she is a staunch devotee of Sai and told me that she performs Rudra Abhishek every Monday. I had a thought of visiting her home that evening and later I changed my mind and called her to send me the video if she has recorded any of her previous poojas in her camcord. She made a sincere search and said, “Didi, sorry I could not find it why don’t you join us for today evening abhishekam and I will start the pooja according to your time of arrival. Now I should say, Sai had planned for me and he allotted time to visit her home and we did abhishekam and got a very clear idea of the same, now the question of getting Shivalingam,? I browsed through online stores but not sure about the size and was in a dilemma, I wanted to have a silver one and this girl also told me it would be nice if it is with snake. Somehow I wanted Sai to bless me in getting the same rather than me purchasing from a shop. I wanted to wait till Thursday and with full hope and faith on my Sai I was making preparations for the puja.Thursday dawned and it was my little one’s birthday we went to Sai mandir and I enquired in the mandir whether there is any possibility of getting a shivalingam for abhishekam ?And Yes, my Sai did bless us on our son’s birthday with a tiny, silver, Shivalingam with snake around. I was so happy and really kissed it and took as my Saima’s gift for my son’s birthday, and made my offerings. I was also told that this was the only shivalingam in the mandir of this kind left out. I was enquiring whether there is any chance of getting a little bigger one, but the answer was NO. The next day I was getting some doubts about performing abhishekam to this shivalingam as the size is very small, heart to heart I was talking to my Sai, “Sai, you blessed us with lingam but the size is so small how can I do abhishek ? That too nearly 11 ladies will be performing abhishekam. 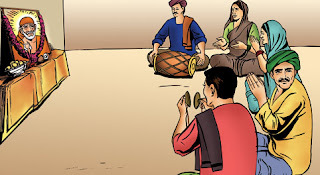 My mind was pondering in this issue and that noon just after Madhyana arati I received a call and to my utter surprise it was from Sai mandir the good soul who gave me shivalingam on the previous day called me to say that." 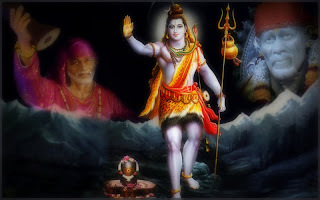 He has got another lingam big enough to perform abhishekam and little heavy too” he also added that he has a sonmukhi rudraksha and wanted the same to be kept in puja. He asked when I can come and collect from him. I was really speechless and tears rolled down from my eyes, how well my Sai has set everything ready for me. Who can understand HIS love for his children? The next day my husband went to collect the lingam and now all set to start the puja. My wish of getting Shivalingam through Sai was fulfilled and I was so happy for all HIS unfathomable ways. 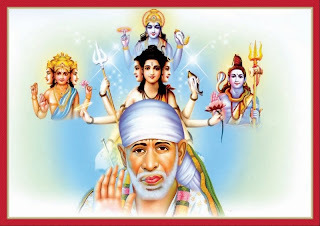 On 28th Sai was on my side and helped me to cook all the Prasad from 3.30 a.m. for all his children and all the devotees were able to attend the puja and performed abhishekam to Lord Ganesha, Sadguru Sainath and to his divine padukas, Lord Shiva with milk and panchamrutam. Just then another devotee came from Sai mandir brought panchamrut from mandir, and Akshatas, it gave a feel as though Sai sent all this to bless us. We read Sai Satcharitra, Sai Ashtotaram, and the puja ended up with Noon Arati. One aunty while performing arati was in escatic mood and started to behave like God possessed tears rolled down from her eyes and eyes closed, her body was not steady it was shaking and she was totally in a different world and all of us were in complete bliss and felt the presence of Sai in our home. In the evening Sai blessed us to go to mandir share the Prasad with the devotees there and as a bumper blessing we also got another golden chance to perform abhishekam to Sai and to Shivlingam.As my older son and my husband did not do at home and my Sai fulfilled even that wish of mine. I was still missing something deep in my heart and was having a pain and was longing for some more proof for Sai’s presence as usual inspite of understanding the fact that Sai is always with me, inspite of all this blessing I was still greedy for more blessings from Sai . he asked me mom, “how did the apple roll”? He immediately shooted a question which pierced my heart like an arrow he asked, Mom, "Baba gave you this apple, and how can you slip it from your hand??? I was spell bound and I also realized that why am I still longing as my Sai had already given me Prasad and gave his darshan, made the whole family to perform abhishekam what more?? 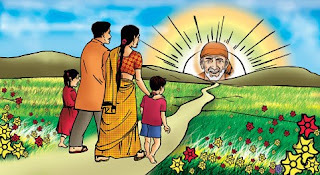 I immediately realized my mistake and said Sorry,” I will not do this mistake again"
I felt Sai spoke to me through my son, after coming home again my mind started to search if I got Sai in my home in any new form, and I was too tired went to sleep and next day I was in tears searching for My Sai. Sai did fulfill and satisfied my this craving Sai has come in the form of a print out of Madhyana arati on each and every page beautiful image of Sai, a friend of mine who came for the puja had brought it and she has misplaced it with my papers. I can only wash your holy feet with my tears and beg you to wash out my sins and accept me whatever, however I may be….